. First released in 2005, this book has been a favorite of visitors, armchair travelers and locals alike. Many people are aware of Sedona as being a great place to shop and eat with a lovely backdrop, but for those who are willing to get off the pavement, it offers so much more. 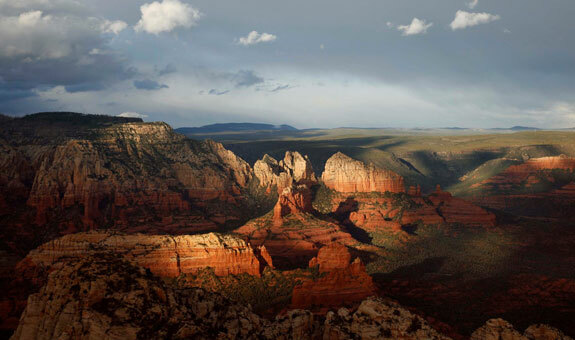 The backcountry around Sedona has beauty beyond your wildest imagination! Hidden waterfalls, springtime wildflowers, prehistoric Indian ruins and artwork, fall color, and wonderful trails to explore. Larry captures Sedona like no one else does because he lives there and gets out in all kinds of weather during all seasons. And this newest edition of Secret Sedona even has 10 new photos over the last edition—one of these new photos even graces this author’s wall in full splendor! (His artwork is available on his site, http://www.larrylindahl.com/). For those of you planning on visiting Sedona, perhaps on a concurrent visit to Grand Canyon, Larry also offers personalized photo workshops in Sedona for very reasonable fees. It’s a great way to improve your skills while having your own personal professional photographer take you out on a Sedona photo hike! Larry also leads several trips for the Grand Canyon Field Institute each year. 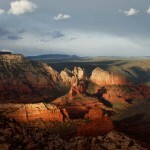 Find out more about the Sedona workshops and Grand Canyon Field Institute trips on his Photography Workshops page.